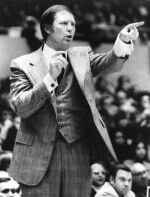 Longtime USC basketball coach Bob Boyd, who led the program for 13 years from 1967 to 1979, died Wednesday of natural causes in Palm Desert, California. He was 84. Boyd was 216-131 as the coach of the Trojans, who reached the postseason four times under his leadership. He was also named conference coach of the year twice. In 1971, Boyd's Trojans went 24-2 and finished ranked No. 5 in the country. His teams also dealt the John Wooden-coached Bruins their first losses at Pauley Pavilion in 1969 and 1970. “He had USC basketball going when I was here," said USC Athletic Director Pat Haden, who played football for the Trojans in the early 70s. "Unfortunately, he had a pretty good coach across town. I remember one year I think we went [24-2] and the two losses were to UCLA and only one team went to the tournament. "He is one of the all-time USC greats and we will miss him. We’ve had our ups and downs in basketball, but he had it really rocking when he was the coach." Prior to the 30 second shot clock he implemented a stall game against Wooden's Lew Alcindor team and beat them. He beat Wooden again in 1970. Boyd had planned on attending the Trojans' game against the Bruins on Wednesday, according to the school's website. Boyd was a three-year letterman at USC before beginning his coaching career with El Segundo and Alhambra high schools. He also held positions at Santa Ana College and Seattle University before joining USC. After leaving the Trojans, Boyd coached at Mississippi State (1982-86), Riverside Community College (1989) and Chapman (1990-92), before serving as an assistant at Louisiana State and Utah State. Boyd was inducted into the USC Athletics Hall of Fame in 2001. He received the same distinction from the Pac-12 Hall of Honor in 2004. He was preceeded in death by his wife Betty and son Bruce. Boyd is survived by his sons Bill, Jim, John and 10 grandchildren. This article was written by Matt Wilhalme from Los Angeles Times and was legally licensed through the NewsCred publisher network.